Objective As few data are available on the causes of fever in children returning from international travel, the authors studied children presenting to a French tertiary care centre with fever. Methods Children presenting to the emergency department of the Robert Debré Paediatric Hospital, Paris, France between July and December 2007 with fever that occurred within 3 months of a stay abroad were included in this retrospective study. Results The children (n=538) had most commonly visited North Africa (NA) (n=214), sub-Saharan Africa (SSA) (n=185) and Europe (n=67). Their median age was 2.8 years (IQR 1.4–5.8). The median time between their return to France and the onset of fever was 5 days (IQR 0–18). Cosmopolitan infections represented 85% of the established diagnoses (97.8% and 63.9% in the children returning from NA and SSA, respectively). Fever of unknown origin accounted for 19.3% of cases. Malaria was the leading tropical infection. Excluding malaria, diarrhoeal diseases were more frequent in the children returning from NA (38.5%) than in those returning from SSA (24.5%). Malaria was associated with stays in endemic countries that exceeded 30 days (OR 3.13, 95% CI 1.02 to 9.59). Conclusion Cosmopolitan infections are the leading cause of fever in French children returning from tropical and subtropical areas. However, all febrile children who have returned from an endemic area should be tested for malaria. ▶ International travel has increased markedly, including among children. ▶ The incidence of fever in returning travellers is higher in children than in adults. ▶ The aetiologies of fever after international travel have been extensively described in adults but less so in children (principally in hospitalised patients). ▶ This study describes the epidemiological and diagnostic features of febrile illness in children following international travel. ▶ The leading causes of fever were malaria after stays in sub-Saharan Africa and diarrhoeal diseases after stays in North Africa. ▶ Cosmopolitan infections are the most frequent causes of febrile illness in children returning to France from abroad. We examined the aetiological diagnoses of children presenting to a French tertiary care centre for fever occurring within 3 months of a stay abroad. All children and adolescents (<18 years of age) presenting to the emergency department (ED) of the Robert Debré Paediatric Teaching Hospital, Paris, France between 1 July 2007 and 31 December 2007 for fever (>38°C) occurring within 3 months of a stay abroad were included in this retrospective study. The Robert Debré Hospital serves a population with low socio-economic status and a large proportion of immigrants.15 Surgical cases (ie, abdominal and orthopaedic cases) were excluded from this study. The patients were divided into three categories: travellers, visitors and migrants. A traveller was defined as a child residing in metropolitan France who had travelled abroad for whatever reason (visits to relatives, tourism, etc) or duration of stay. A visitor was defined as a child born and living outside metropolitan France. A migrant was defined as a patient born outside France who had recently settled in France. The visiting countries were grouped into 11 regions: NA; SSA; South East Asia; Central Asia, including the Indian subcontinent; Central and South America; the Middle East; Oceania; the West Indies; Europe; oriental Russia; and North America. Paediatric patients were included in this study if travel abroad within 3 months of presenting to the ED with fever was reported in the file by the physician. The demographic data, region of travel, length of stay, clinical and biological data and the final diagnosis were abstracted from the electronic medical ED files (UrQual, version 2001; McKesson, Paris, France) to a preformatted electronic case report form. If the child was admitted, information from the hospitalisation reports was added to the preformatted case report form. The diagnostic investigation was determined by the attending physician. Diagnoses of infectious diseases were established clinically (if possible) and/or by isolation of a microorganism in a clinically relevant specimen, or by an elevated titre of antibodies to an infectious agent that was performed according to the clinical manifestations. The diagnoses were categorised according to the site and/or type of infection: upper respiratory tract infection (URTI), lower respiratory tract infection, acute diarrhoea, neurological infection/meningitis/meningoencephalitis, malaria (defined as uncomplicated or severe according to the WHO definition),16 cutaneous infection, other bacterial infections (identified bacterium), other viral infections (identified virus), other parasitic infections (identified parasite), non-infectious disease and unknown cause (including isolated fever). Cosmopolitan infections were defined as infections acquired worldwide. Imported tropical and subtropical diseases (malaria, typhoid fever, amoebiasis, etc) were those acquired only in those regions. The statistical analyses were performed using SAS software, version 9.1 (SAS Institute, Cary, North Carolina, USA). The quantitative variables with a non-Gaussian distribution are expressed as the medians and IQR. The qualitative data are expressed as numbers and percentages. The continuous data were compared using the appropriate non-parametric tests (the Wilcoxon test), and rates were compared using the χ2 or Fisher's exact tests. This study was approved by the institutional review board (no. IRB0006477) of the Paris-North Hospitals, Paris 7 University, AP-HP. The data were anonymised, in keeping with French legislation. Between 1 July 2007 and 31 December 2007, 33 290 children (age <18 years) were admitted to the ED of the Robert Debré Hospital. Surgical cases (n=10 163) were not included. Due to incomplete or unavailable information, 569 medical cases were not included either. Of the remaining 22 558 medical consultations, 538 fulfilled the inclusion criteria. These cases represented 2.4% of all children seen by a doctor in the medical ED during this period. Most of the consultations (n=343; 63.8%) took place in August and September, representing a maximum of 6% of all medical consultations in August. The most visited regions were NA (n=21; 39.8%), SSA (n=185; 34.4%) and Europe (n=67; 12.4%). The other regions visited were the Middle East (n=24; 4.5%), the West Indies (n=18; 3.3%), Central Asia (n=16; 3%), South East Asia (n=6; 1.1%), Central and South America (n=4; 0.8%), North America (n=2; 0.4%), Russia (n=1; 0.2%) and Oceania (n=1; 0.2%). As the numbers of children returning from each of the other areas were low, our demographic and epidemiological analyses focused on the children returning from the three most commonly visited regions. The demographic characteristics of the 538 children are shown in table 1. Their median age was 2.8 years (IQR 1.4–5.4) and almost 90% were defined as travellers. The children travelling to SSA were older and had a longer duration of travel. No difference in the number of children with underlying chronic diseases was observed across the three most visited areas (table 1). There was no difference between the children returning from NA, SSA and Europe in their time to presentation (table 1). Less than half of the patients (234/538; 43.5%) presented to the ED without having contacted a primary care practitioner, while 214 patients (39.8%) had consulted a primary care practitioner; 41/214 (19%) of these consultations had occurred in a foreign country before the child's return, and 173/214 (81%) had occurred after they had returned to France. In France, general practitioners were the most commonly consulted physicians (126/173; 72%). Thirteen patients had consulted a paediatrician, and five patients had consulted a local paediatric primary care centre. Twenty-seven patients were referred to our ED by another hospital. The leading identified causes of fever were acute diarrhoea (27.1%), URTIs (26.4%) and malaria (9.5%). Cosmopolitan infections represented 85% (369/430) of the established diagnoses, and 97.8% (177/181) and 63.9% (94/147) of the confirmed diagnoses among children returning from NA and SSA, respectively. No aetiological diagnosis was made in almost 20% of cases. The detailed causes within the different diseases groups are reported in online supplementary appendix 1. The distribution of the diagnoses according to the three most commonly visited regions is reported in figure 1. Distribution of the main diagnoses according to the three most commonly visited regions: Europe, North Africa (NA) and sub-Saharan Africa (SSA). *Non-infections causes accounted for 3.0% in Europe, 0% in NA, 0.5% in SSA and 0.7% in total. **Other microbiological infections accounted for 2.1% in SSA. 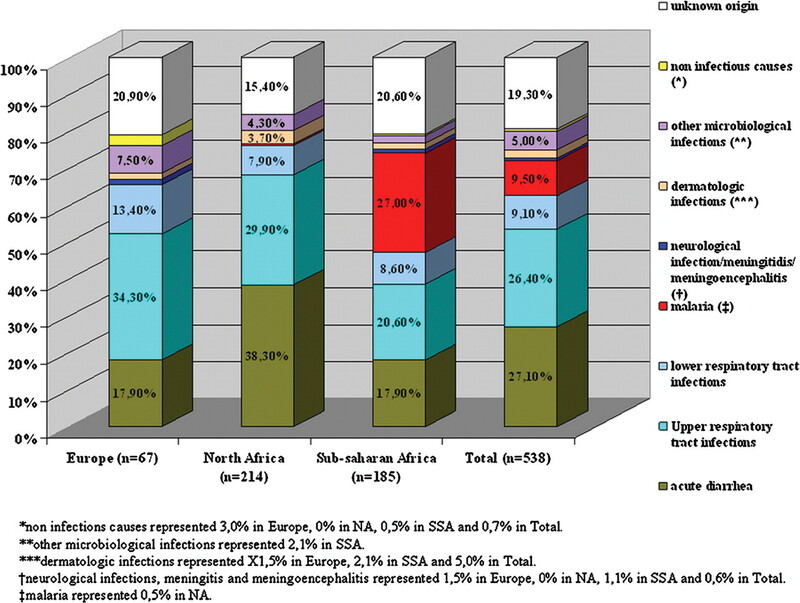 ***Dermatological infections accounted for 1.5% in Europe, 2.1% in SSA and 5.0% in total.†Neurological infections, meningitis and meningoencephalitis accounted for 1.5% in Europe, 0% in NA, 1.1% in SSA and 0.6% in total.‡Malaria accounted for 0.5% in NA. The leading causes of fever after a stay in NA were acute diarrhoea (38.3%) and URTIs (29.9%). Excluding malaria, the proportion of diarrhoeal diseases was significantly higher in children returning from NA than in children returning from SSA (82/213 (38.5%) and 33/135 (24.5%), respectively; p=0.0001). Malaria (27%) was the leading cause of fever, being diagnosed in more than 25% of children returning from SSA, followed by URTIs (20.6%) and acute diarrhoea (17.9%). Among children returning from SSA, stays longer than 30 days were associated with an increased risk of malaria (OR 3.13, 95% CI 1.02 to 9.59; p=0.046). Malaria was diagnosed within 28 days after returning to France in 90% of cases. Febrile children returning from malaria-endemic areas were tested for malaria in 90.7% of the total cases (196/216) and in 94% of cases (174/185) returning from SSA. The children with diarrhoea had stool microbiological investigations in 40.4% of cases (59/146). In children with a final diagnosis of acute diarrhoea, stools were cultured and tested for bacteria, parasites and viruses in 39.7% (58/146), 9.6% (14/146) and 16.4% (24/146) of cases, respectively. Pathogenic bacteria, parasites and viruses were identified in stool samples from 50% (29/58), 7.1% (1/14) and 16.7% (4/24), respectively, of the children concerned. No dengue serological tests were performed in the 18 children who had returned from the West Indies, despite an ongoing epidemic in that region. In total, 116 children were hospitalised (21.5%): six in the paediatric intensive care unit (PICU), 65 in a short-stay (<24 h) observation unit, and 45 in the general paediatric unit. The median age of these 116 patients was 3.9 years (IQR 1.7–11.1). The main reasons for hospitalisation are shown in online supplementary appendix 1. The leading reason was malaria (n=41), with four children hospitalised in the PICU (three cases of severe Plasmodium falciparum malaria and one case of uncomplicated P falciparum malaria with major vomiting that required intravenous quinine). The malaria patients were hospitalised for less than 24 h in 30 cases and for more than 24 h in 11 cases. Only 19.6% of malaria patients received solely outpatient treatment (n=10). All of the hospitalised patients made a full recovery. Febrile illness after return from international travel has been extensively investigated in adults but less so in children.9 17,–,23 We describe the epidemiological features of early-onset fever among children presenting to the ED of a large French paediatric tertiary care centre following their return from abroad. The most commonly visited regions were NA and SSA. The main causes of fever among the children returning from these regions were cosmopolitan infections, especially diarrhoea after stays in NA. However, malaria was the leading cause of fever after stays in SSA. Diarrhoeal diseases were an important cause of fever in children returning from NA and SSA, especially in those returning from NA, which is consistent with the results of previous paediatric and adult studies.12 24 This finding underlines the importance of prevention messages about diseases transmitted by the faecal-oral route for parents of children travelling to NA. The distribution of imported illnesses was different from that reported in British paediatric studies.25 In our study, it was characterised by a predominance of P falciparum malaria and fewer cases of enteric fever. This finding reflects differences between the two countries in their histories of colonisation and migration. In the UK, the most commonly visited region was the Indian subcontinent, where Plasmodium vivax is the main form of malaria and enteric fever is common.10 11 This emphasises the fact that the distribution of the diseases seems to be related to the ethnic origins of the local population. EDs should take into account the ethnic origins of the local population in order to optimise the management of children with febrile illnesses after return from abroad. The time between fever onset and presentation to our institution was shorter than that observed in adult series, which is consistent with a previous study.12 17 19 This finding may have resulted from fever being perceived as a strong alarm symptom in children. More generally, fever is a leading reason for medical consultation, whether after travel or not. Nearly half of the children in our study had presented to a primary care provider before attending our ED, underlining the importance of these facilities and particularly the role of general practitioners, in the initial management of febrile children returning from abroad. This finding calls for a strengthening of the medical capacity of primary care staff and further training in tropical medicine for primary care providers in areas with a high proportion of immigrants. More than 20% (116/538) of the children who presented to our ED were hospitalised, a rate higher than that reported in a previous study (14%).12 The increased rate may be related to the large proportion of young children in our study population and to the frequency of P falciparum infection, which can cause severe malaria.12 29 Differences in paediatric hospital admission policies could also be a factor. The GeoSentinel Surveillance Network recently described travel illnesses in 1591 children over a 10-year period.12 Compared to our report, the GeoSentinel study examined all illnesses rather than only febrile illnesses, which rules out any direct comparisons. Despite a short study period (6 months), we investigated a large number of children. The interval between return from travel and symptom onset (3 months) in our study, which was chosen to limit the number of illnesses unrelated to travel, was shorter than the 10-year interval in the GeoSentinel study. Finally, our study was performed in a general paediatric ED rather than in the specialised travel and tropical medicine clinics of the GeoSentinel Network. This difference could have contributed to the large number of cases of fever of unknown origin diagnosed in our study. Another limitation of our study is its retrospective design. Indeed, our study is based on physicians' reports that may have underestimated the proportion of children who had recently travelled abroad. The high frequency of diarrhoeal diseases, particularly in the children returning from NA, emphasises the need for better prevention of diseases with faecal-oral spread among families travelling to these areas. Tests for malaria should be systematically performed when a febrile child has returned from an endemic area, regardless of the symptoms. Also, cosmopolitan infections are the most frequent diagnoses in children returning from abroad. The authors thank Professor Eric Caumes for scientific assistance.
. The burden of illness in international travelers. N Engl J Med 2006;354:115–17.
. Health problems after travel to developing countries. J Infect Dis 1987;156:84–91.
. Illness after international travel. N Engl J Med 2002;347:505–16.
. Health problems in a large cohort of Americans traveling to developing countries. J Travel Med 2000;7:259–66.
. In: United States. Dept. of Health and Human Services, Centers for Disease Control (U.S.), National Center for Infectious Diseases (U.S.). Division of Global Migration and Quarantine , eds. Health Information for International Travel 2007–2008. Philadelphia, PA: Elsevier Mosby 2007.
. Prevention of infectious diseases among international pediatric travelers: considerations for clinicians. Semin Pediatr Infect Dis 2004;15:137–49.
.; GeoSentinel Surveillance Network. Spectrum of disease and relation to place of exposure among ill returned travelers. N Engl J Med 2006;354:119–30.
. Illnesses in travelers returning from the tropics: a prospective study of 622 patients. J Travel Med 2005;12:312–18.
. Prospective, hospital based study of fever in children in the United Kingdom who had recently spent time in the tropics. BMJ 1998;316:1425–6.
. Fever in returned travellers: a prospective review of hospital admissions for a 2(1/2) year period. Arch Dis Child 2003;88:432–4.
.; GeoSentinel Surveillance Network. Illness in children after international travel: analysis from the GeoSentinel Surveillance Network. Pediatrics 2010;125:e1072–80.
. [Les décès de français lors d’un séjour à l’étranger et leurs causes]. BEH 2006;23-24:166–8.
. French tourists abroad in 2006: results from the survey “Follow-up of Tourists preferences”. BEH 2007;25-26:218–21.
. [Ile de France-1,9 millions d’immigrés en 2004]. INSEE- Faits et chiffres: 2006. Accessed at http://www.insee.fr/fr/insee_regions/idf/themes/faits_et_chiffres/fc/numero137.pdf (accessed 28 March 2011). WHO. Guidelines for the treatment of malaria, second edition. 2010:1–194. Accessed at http://whqlibdoc.who.int/publications/2010/9789241547925_eng.pdf (accessed 28 March 2011).
. Etiology and outcome of fever after a stay in the tropics. Arch Intern Med 2006;166:1642–8.
. Fever as the presenting complaint of travellers returning from the tropics. QJM 1995;88:277–81.
. Fever in returned travelers: review of hospital admissions for a 3-year period. Clin Infect Dis 2001;33:603–9.
. Clinical and laboratory predictors of imported malaria in an outpatient setting: an aid to medical decision making in returning travelers with fever. Am J Trop Med Hyg 2002;66:481–6.
. Prospective observational study of fever in hospitalized returning travelers and migrants from tropical areas, 1997-2001. J Travel Med 2004;11:135–42.
. Fever in travelers returning from tropical areas: prospective observational study of 613 cases hospitalised in Marseilles, France, 1999-2003. Travel Med Infect Dis 2006;4:61–70.
.; GeoSentinel Surveillance Network. Fever in returned travelers: results from the GeoSentinel Surveillance Network. Clin Infect Dis 2007;44:1560–8.
. Fever after a stay in the tropics: diagnostic predictors of the leading tropical conditions. Medicine (Baltimore) 2007;86:18–25.
. Fever in the returned paediatric traveller. Adv Exp Med Biol 2009;634:217–30.
. Imported Dengue and Chikungunya Infections in Continental France. INVS 2008:1-28. Accessed at http://www.invs.sante.fr/publications/2008/cas_importes_chik_dengue/cas_importes_chic_dengue.pdf (accessed 28 March 2011). WHO. Dengue Status in South East Asia Region: An Epidemiological Perspective. 2008. Accessed at http://www.searo.who.int/LinkFiles/Dengue_dengue-SEAR-2008.pdf (accessed 28 March 2011).
. Incidence and clinical features of traveler's diarrhea in infants and children. Pediatr Infect Dis J 1991;10:719–23.
. Imported malaria in children: a review of clinical studies. Lancet Infect Dis 2007;7:349–57. JN and RB contributed equally to this work. Ethics approval The Comité d’Evaluation de l’Ethique des Projet de Recherche Biomédicale (CEERB) from GHU Nord (institutional review board no. IRB0006477) approved this study.